(ETA: I wrote this over a week ago and forgot to hit post! I’m all better now!) In hindsight, I’m not surprised that my last post was full of little frustrations because immediately after that, I got sick. Today is the first day in over a week that I haven’t woken up dizzy with a headache. I’ll be glad to see the back of January! Although I still managed to struggle in to work, I also managed to do things like pick up a puncture on the bike and not close the car boot properly so when I went to go to work on Sunday, the battery was dodo. Luckily for us, a friend was able to give us a jump so the car is ok. I’ll be able to retrieve my bike from school and fix the puncture tomorrow. 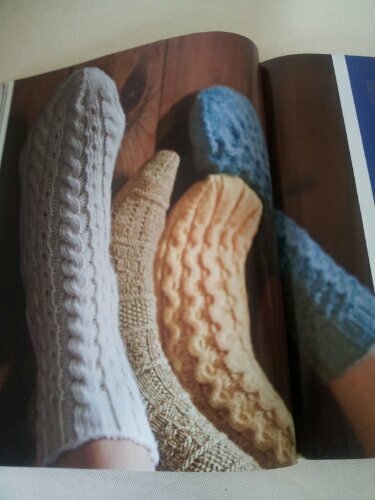 All this to say that there are times when one really needs a good pair of comforting socks – to knit and to wear. 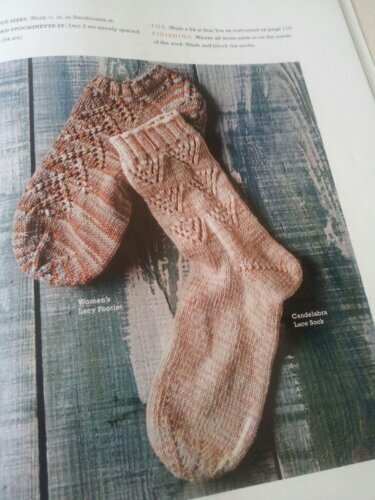 I used Patons Diploma Gold DK which is a 55% wool/25% acrylic/20% nylon blend and very soft and squishy. I was really pleased with the definition in the cables considering the high artificial content. 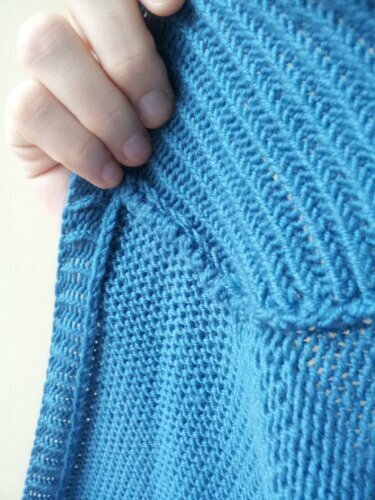 I tried out a new cast on, a stretchy rib cast-on that I found in the ‘Cast on, Bind off’ book (reviewed here). It worked very well but I would prefer a neater edge. It is very stretchy though. 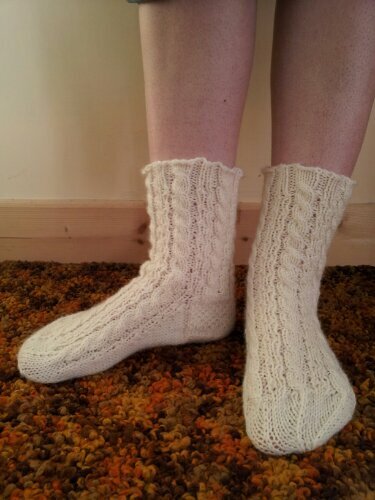 I used a new (to me) type of heel – eye of partridge – and I love it! They have star toes as well. They’re ok. I’m not sure if I like them or not. They’re very comfortable but since my toes turn my foot into a sort of triangle at the top, I’m wondering if I should stick to the wedge toe I usually make. 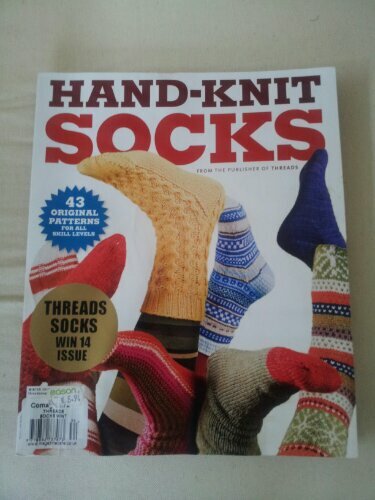 The pattern is one from this magazine, a seemingly once-off edition of ‘Hand Knit Socks’ from the publisher of Threads magazine. Here it is listed on the publisher website. I paid €6.94 for it in Easons (O’Connell St) and they had a big stack of them about two weeks ago so they still might have some. It’s more like a book than a magazine to be honest. They cover pretty much everything you would want from a sock. It starts with tube socks in a variety of weights and sizes. Most of the patterns range from childrens (sometimes even babies) sizes all the way up to large mens. 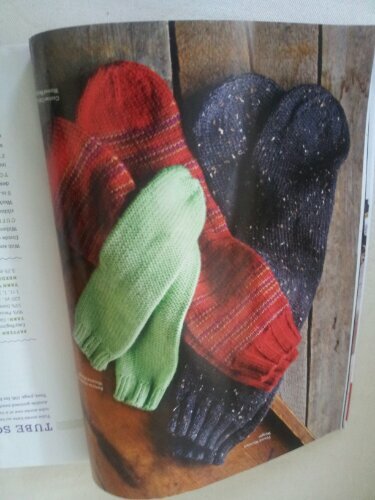 …as well as colourwork socks and more crazy-looking socks with bobbles, beading or thrumming. There’s a big variety in terms of yarn weights used so the possibilities for shopping your stash are high. The other thing I really liked about it is that at the back, there is a comprehensive reference section for heels and toes. They give the numbers and methods for all of the toes and heels used, such as short row heels, flaps and gussets, wedge toes, star toes and so on. The patterns refer you to this appendix according to what size you’re knitting. It’s quite clear and a really handy reference to have if you’re knitting a different sock but want to change the toes or heels. You can match up your stitch count to the reference and continue on. 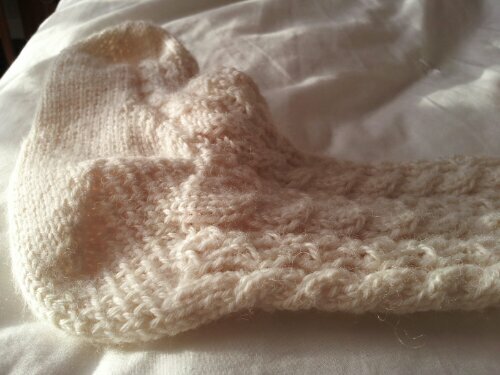 I found an error in the written instructions for this sock – one or two of the twists are reversed. In this instance, a chart would have been clearer but I just adjusted my knitting so it looked like the photo. Nobody probably noticed but I was foiled in my attempts to post an outfit for October. There were two reasons. Firstly, all my photos were out of focus thanks to user error and secondly, in said photos, I noticed a fitting problem that I couldn’t rectify. 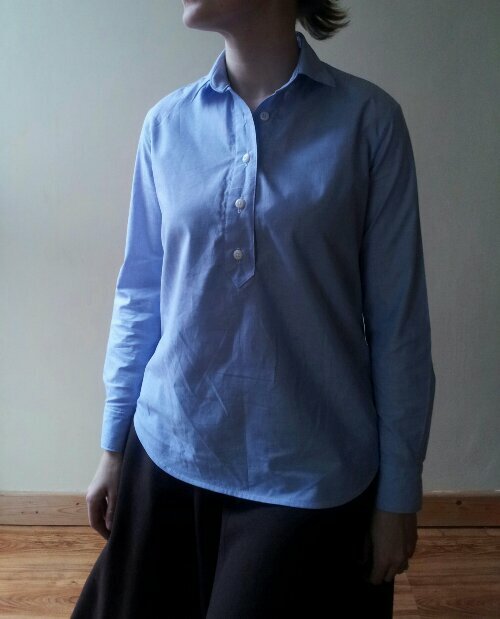 So I have put the blouse of said post to one side and here’s the skirt that I made in another combination. 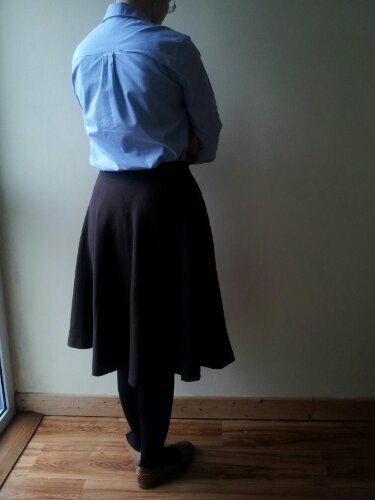 The skirt is Sewaholic’s Hollyburn, a flared number that comes in three lengths – this is the middle length. 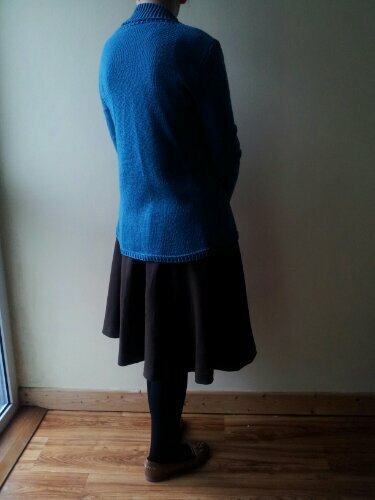 I used a chocolate brown wool crepe from Truro fabrics. It was my first time using a wool crepe but it won’t be my last! It’s one of the easiest fabrics I’ve ever seen and pressed like a dream. Swoon! The pattern is very straight forward, with a high waist and pockets. I’ll definitely be making this in a shorter length for summer! The shirt is the Grainline Archer modified into a henley. I kind of tore my hair out over this one (needlessly) but I learned lots from doing it and it turned out well. I used a lovely light, pale blue chambray that I got before Christmas. 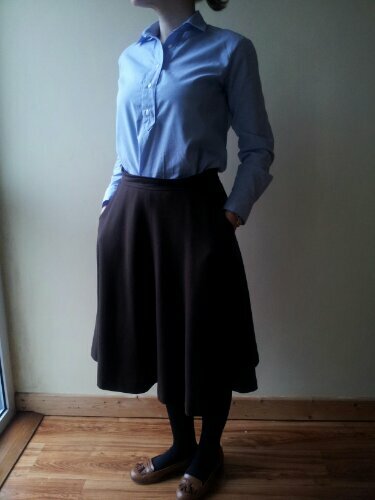 I don’t think this is necessarily the best blouse to wear with this skirt but I do like pale blue and brown together. 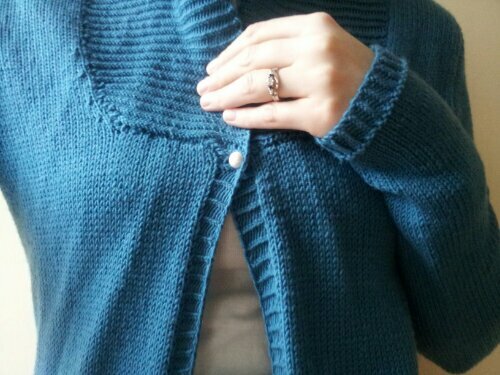 I also finished my Larch cardigan! Short row shawl collars are sloooow to knit. Everything looked a bit uneven so I blocked it with great results. For this, I used eight balls of Debbie Bliss Rialto 4-ply so as cardigans go, definitely not the most expensive. It has a really, really nice drape which I think will go even better over skinny jeans or belted with a pencil skirt. 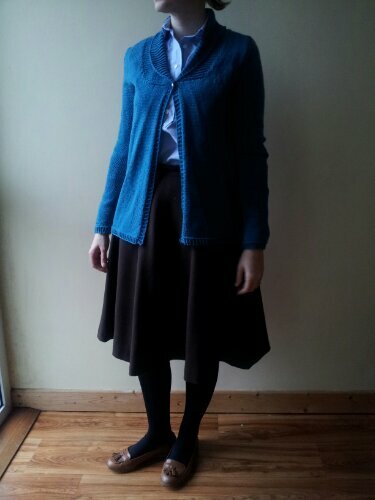 The instructions say to work the shawl collar and then sew the side edge to the cardigan. I didn’t think that would be easy to accomplish neatly so I attached it as I went, picking up a stitch each time and working two together. It worked fine but because I was working back and forth, the two sides ended up a bit different. In the end, I sewed in a little ridge in the inside to make them both look the same. Upon close examination I guess it’s not undetectable but I doubt many will care to examine. I’ve been wearing this a lot recently! It’s been so stormy and miserable here, I just love pulling this on.